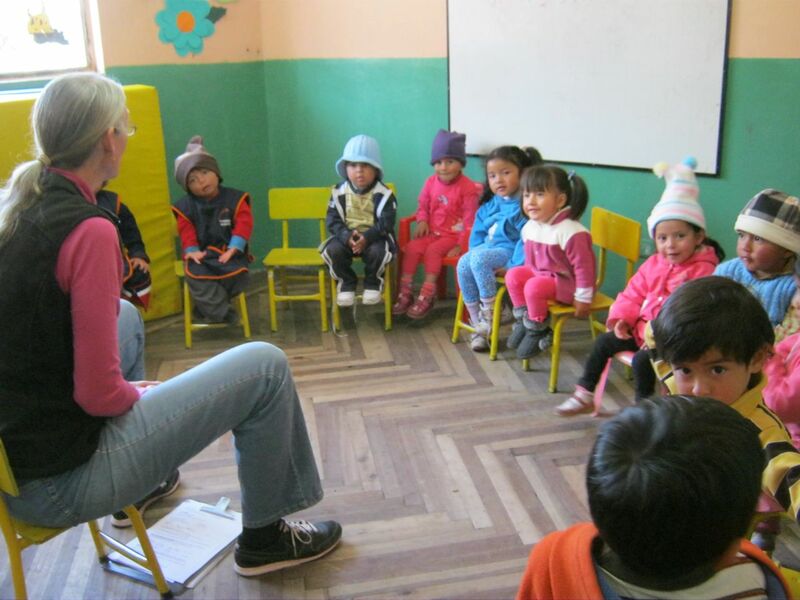 Last September, I taught English for a week in a suburb of Latacunga called San Francisco. This community has had a history with FEDICE for a number of years. 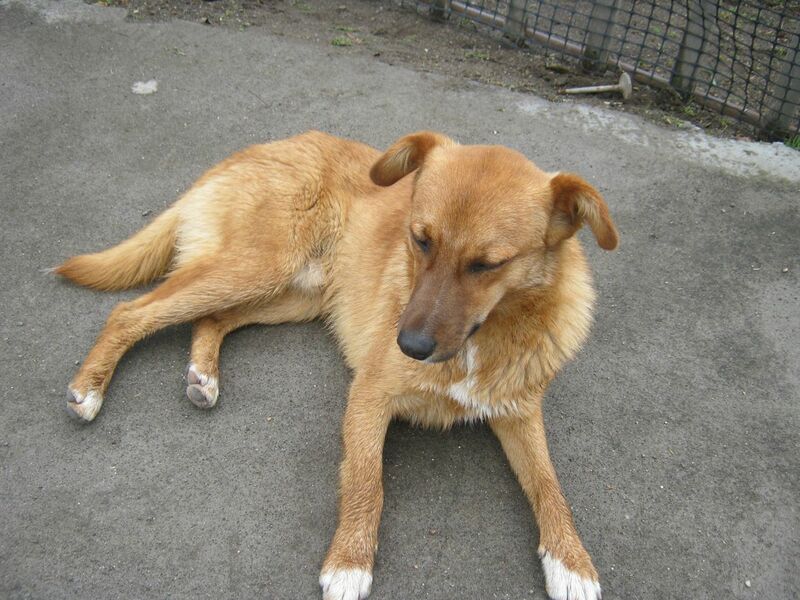 FEDICE has assisted with different animal projects and with a pre-school. 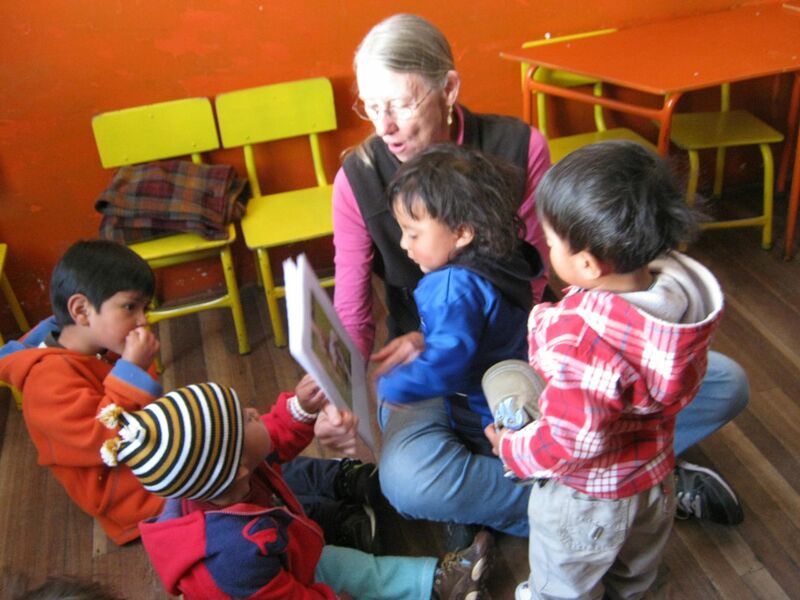 For 7 years, the pre-school has been in a community leader’s home. They serve 40 children in cramped spaces, but the mothers are very grateful to have someplace to leave their children during the day while they work. 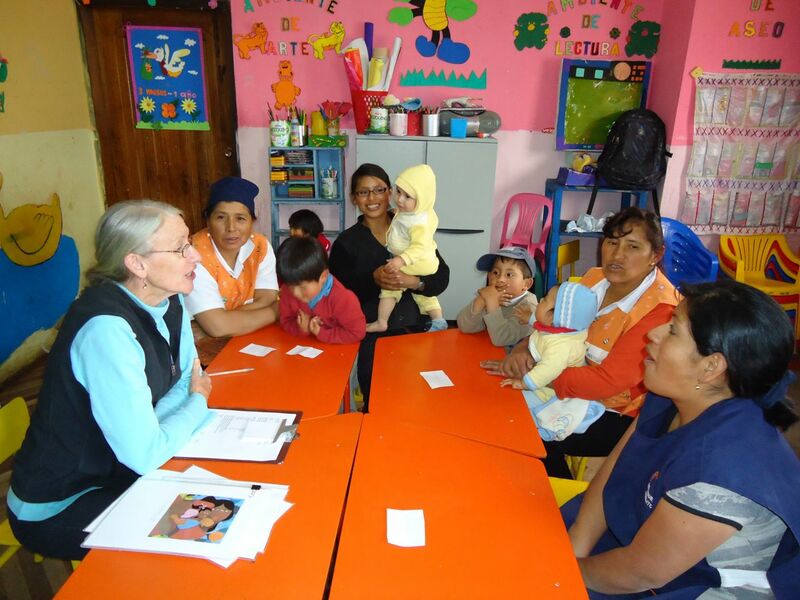 Digna, whose house is where the pre-school is located, serves on FEDICE’s board of directors and asked that I return for another week of English for the pre-schoolers and their teachers. And here Glenn and I are to share more English. This time, we are staying in one of the teachers’ homes. Carmen has set aside half of the space in her one very large room, cinder block house for us. We found out that this space is usually her 6 (almost 7) year old son’s bedroom. We thanked him for sharing with us. 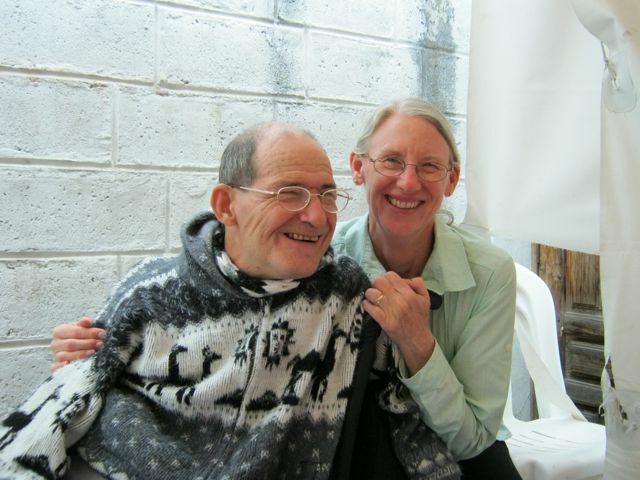 This afternoon he has informed us that his birthday is on May 7th, Mother’s Day here in Ecuador. Cristian is a very nice child, well mannered, quiet but sociable, loving. I would not be surprised if Carmen felt he was a very special gift that she has received in life. Glenn has said that the conditions we are staying in are not what we're accustomed to. Our camping experiences help us to be flexible. The bathroom is across the driveway as is the kitchen. 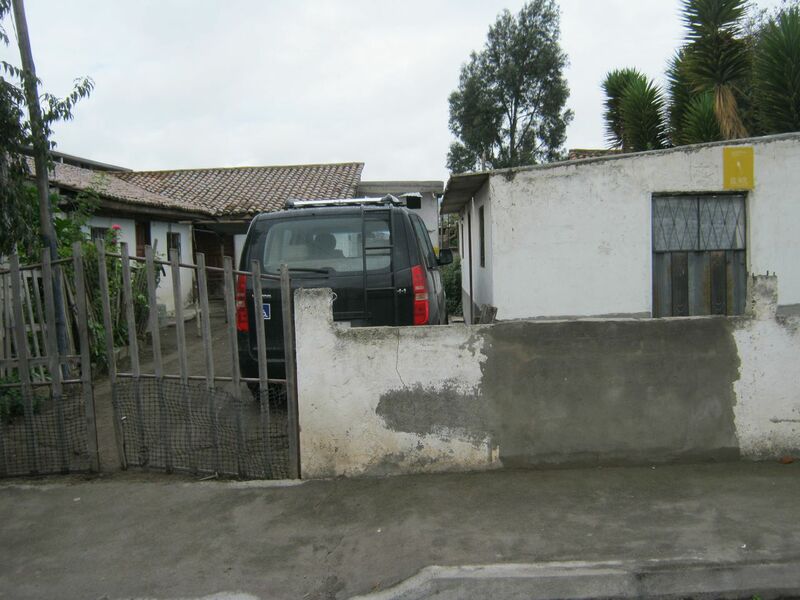 Carmen rents out another space across the driveway occupied by a small family with a 7 year old, Anita, who plays in the afternoons with Cristian. Carmen and her brother, who lives across the river that passes just below Carmen’s back garden, raise rabbits and a pig behind the house. The garden provides greens for the rabbits and corn for the pig (I think). Nothing is wasted here. All scrap food is fed to the pig. Carmen also has a dog named Blackie. I am not sure where they got the name, maybe from a television show, but they did not quite get the significance of the name. Blackie is the color of coffee with milk. Several laughs have been shared with both Carmen and Cristian about Blackie’s name. We are very fortunate that Carmen sees us not as a burden for the week, but some fun visitors. Some of her relatives have come by to visit as well. 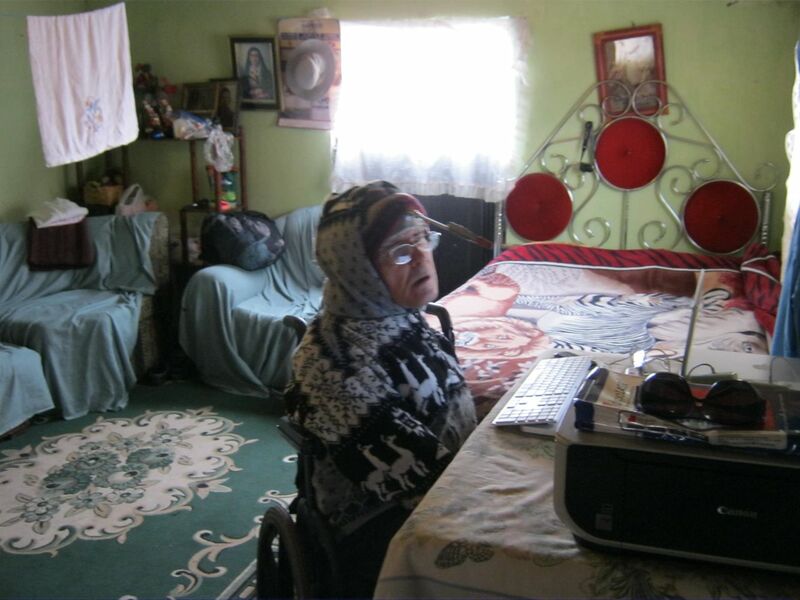 Guadalupe, an older sister, has a grandson with a somewhat similar handicap to Glenn. She came by this afternoon and enjoyed meeting Glenn and hearing that he has worked during his life. She plans to bring her grandson so he can meet Glenn the next time we are in town. I believe my classes are going well. After 3 years of teaching preschoolers, I think I have a decent system and for sure, my students are learning some things. Glenn said they would not have invited me back if I was doing a bad job. I love Glenn’s support! In the mornings, I teach three levels of the children. My first class is the almost verbal 1 and 1/2 and 2 year olds. We sing very simple songs. I show pictures of animals and we talk about what they eat and where they live. Today, my third day of teaching, none of the children cried. One spent almost all the class as far from me as he could get, but when it was time to say goodbye and to shake hands, he came over to shake my hand. One girl spent most of the time hiding her face in a bookshelf, but I suspect she was listening the whole time. The other seven children sat on the floor with me. Cristian (another, younger Cristian) likes to try to grab my glasses. Israel says some of the words with me. Mateo repeats the Good Morning song. It is a fun class. Myra, their teacher, and I enjoy an occasional laugh at their antics. My second class is the 3 and 4 year olds. When their teacher needs to leave, they pay less attention (as do all the classes), but these children speak and they know what un chancho, un perro, un gato, un pollo is and sometimes it is hard to convince them that these animals can be called a pig, a dog, a cat, and a chicken. But Carmen helps convince them. They like to take excursiones around the room on imaginary journeys. They also like songs. This group, as is my third group, is learning greetings and responses to “How are you?”. They are also working on “I have __ __________.” What is so great, is that when I leave, Carmen will continue helping them with these sentences. The children can already count to 10 in English because we worked on that in September and that has been reinforced. The last morning class is the 4 and 5 year olds. They might be more mature, but they can also pay less attention if I do not keep the class interesting. Today, they did a great job with “I have a dog” and “I have a cat”. Tomorrow, they will be learning some responses to “How are you?” other than “I’m fine.” I suspect they are up to the task. Anabel, their teacher, practiced English with the children in the afternoon yesterday. Today, the children came understanding that “How are you?” is a question that requires an answer and “I’m fine” is a good one. It takes a village to raise a child. I walk the long block back to the house after my morning classes and think through my afternoon class with the teachers. Then a little after noon, I return to the pre-school to bring back Glenn’s and my lunch. In September, we got sick from something we ate the last day, so we and the school are being extra careful with our food. I reheat it in the kitchen when I get back to Carmen’s. There is not much in the way of fast food here in Ecuador. The children’s food is prepared fresh by two cooks each day. They get breakfast before I arrive and what I see left of it is often bread and a drink. Lunch usually includes a fresh fruit drink (cantaloupe today), a soup with potatoes and pasta or rice, some meat, and vegetables, and a main dish of rice or corn with beans or another meat or egg. There is no dessert but the children usually get a fruit for a snack in the morning (banana or watermelon, etc.). After lunch, I return the dishes and teach the teachers while most of the children take a nap. I say “most” because there are always a few criers who either have not fallen asleep or have awakened and a few other children that do not nap. So in this crowded room I try to hold class among a certain amount of chaos. My adult students make very valiant efforts at listening, hearing, participating, and learning the new English words while holding children in their laps or reminding children to be quiet. But they do learn. They are very motivated as they think of these children’s futures. To speak English is to have a better paying job and their children are among the children that attend the school. Cristian is brought by bus to the preschool after his classes are over in Latacunga (a 15 minute drive away). After the adult class, we walk back to his house where he plays with Anita until Carmen comes home around 5:00 or 6:00 p.m. The two of the children play very well together. After awhile, they come inside and want to practice some English. They ask me how to say different things in English and I give them little verbal tests on what they are learning. It is a fun game for them, which is kind of how I see Spanish. I like to see how much I can communicate or how many new words I can remember. It is almost like playing a puzzle, putting all the pieces in the right places. Around 6:30 or 7:00 p.m., we have a little to eat. It has been very cold and rainy the first 2 days and nights so Glenn and I were quite happy to go to bed after we ate. Today was amazingly clear and warm. It occurred to me that this was a perfect day to drive the Avenida de Vulcanés, the PanAmericana south of Quito where one drives by many volcanos. From our neighborhood, I can see three snowcapped volcanos. 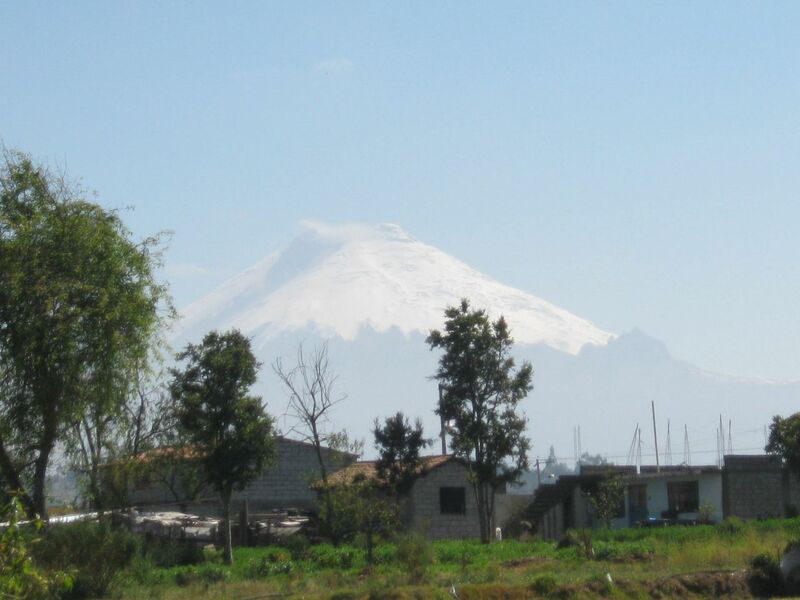 In my experience, it is not often that one can see the tops of the volcanos because they are usually covered by clouds. Tonight we have a nearly full moon to boot and there are stars out. I could see Orion, one of the few constellations I can identify. I wish I knew more about the Southern Cross. Tonight probably would be a good night to see it because of the clear skies. 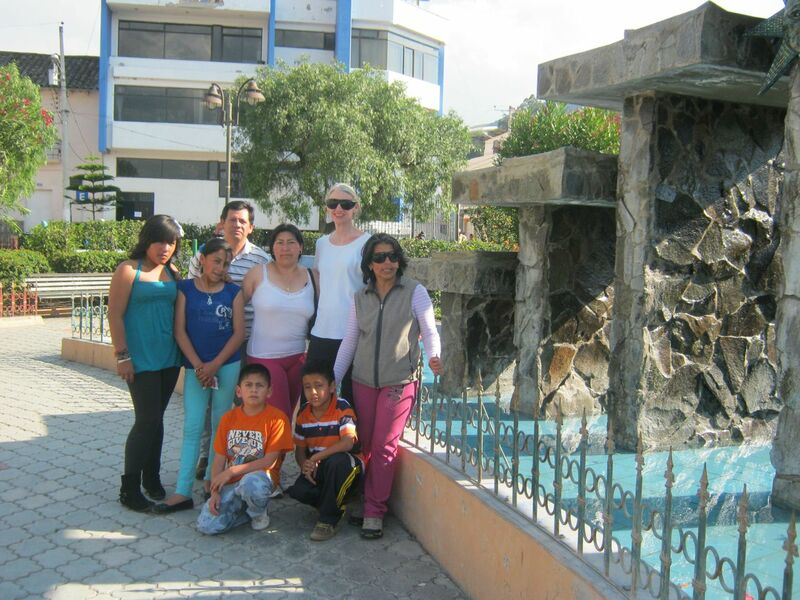 On Friday afternoon, we will return to Otavalo and to our more comfortable home and family. I know we will not regret the time we have spent here, making more friends, sharing our lives with others. FEDICE surely gives us a number of opportunities that we benefit from. Our lives are quite full thanks to God. It was an emotional time leaving last Friday. After I taught my three children’s classes and before I could slip out the door, all the teachers gave me big hugs and said “Thank you’s” for the gift of English they received for the week. There was a small presentation of Thanks for the time I spent and questions as to when I was returning. 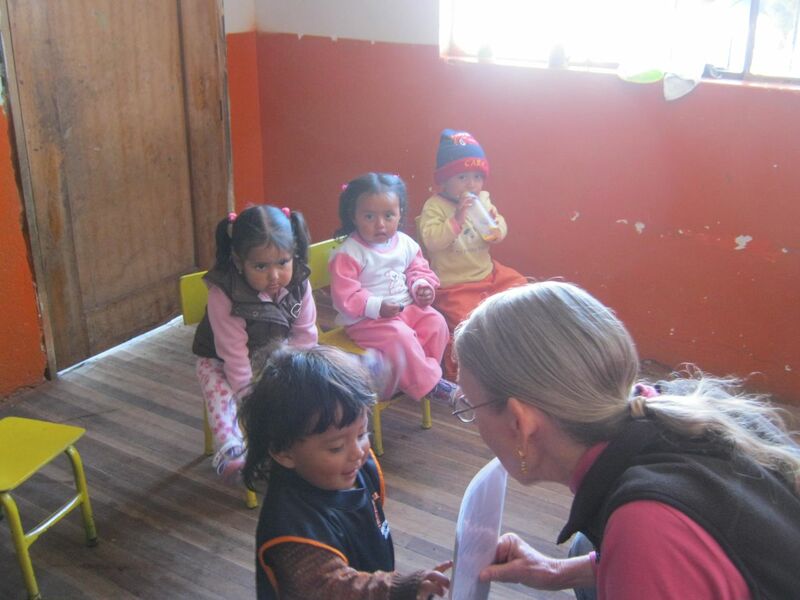 That will be in September, a few weeks after the older children move on to la escuela and new children take their places in the preschool. Carmen walked back to her house with me so she could help me load up our luggage, help get Glenn in the car, and direct me out of the narrow driveway. There were tears in her eyes when we shared our last hug. Whenever I leave somewhere that has been a very good time, I seem to drive slower for awhile until I can transition into the present and the future. 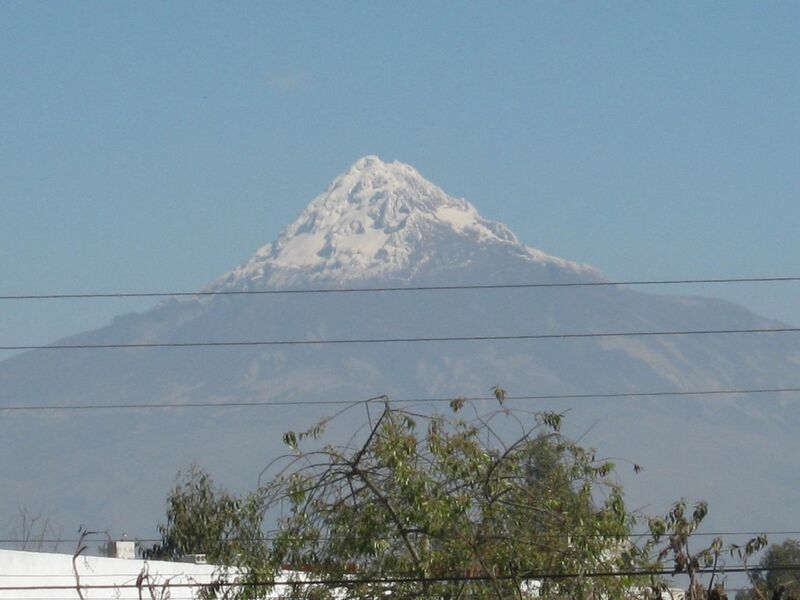 On this clear day, we could see the volcanoes, Cotapaxi and Los Illinizas, and several other tall mountains. It did not take long to get to Quito where we stopped for a sandwich and to call Isabel to tell her not to wait lunch for us. We arrived back home in the mid-afternoon to hugs from Isabel, Brayan, and Victoria who missed us the week we were gone. Our stories were shared of the week we were not together. And God is thanked for a safe and successful journey. Love your posts....they are always so informative. See you on Wednesday, Marilyn. Love you guys, and one of these days I´ll be up there again to visit with you. Wonderful things are going on there! God is moving in your midst. I've just read about your San Francisco lessons. What a wonderful gift you give and receive in return. 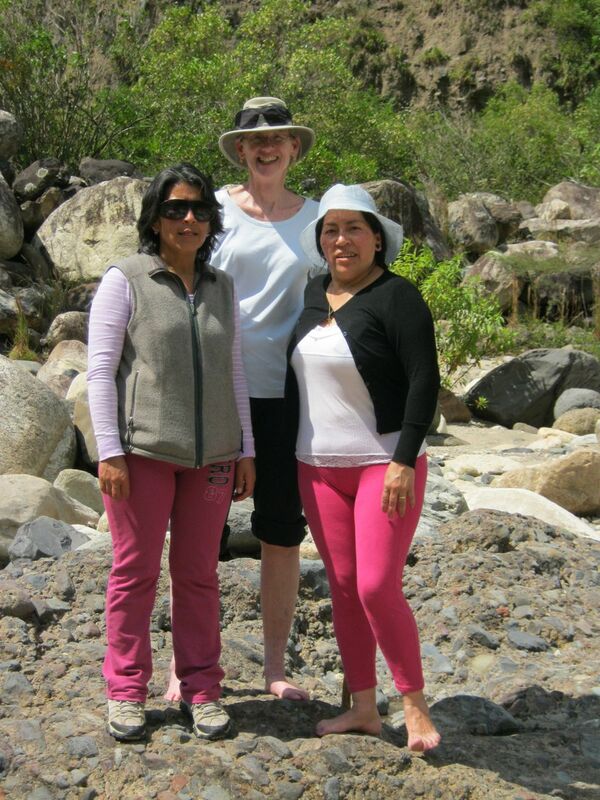 We went to a place where Marilyn had gone on a field trip with her Quechua class a couple of weeks ago. 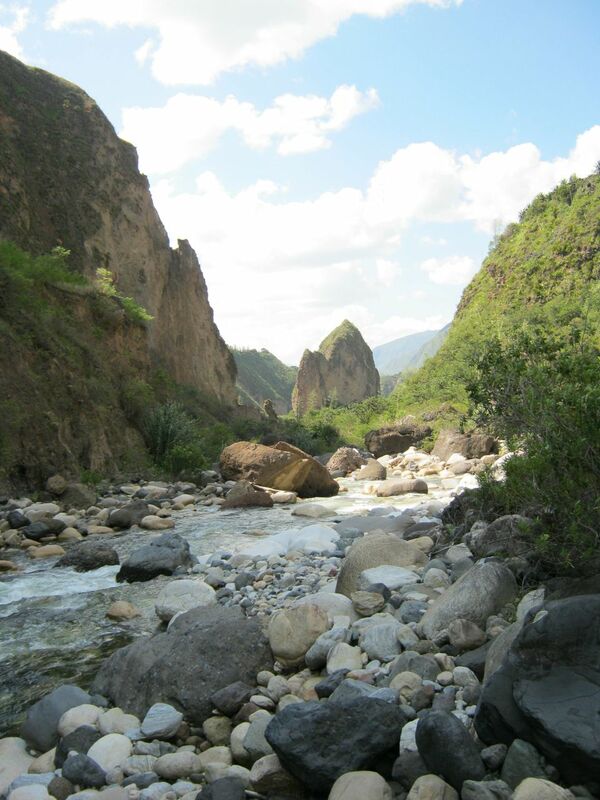 It was the Rio Blanco, about a half hour east, or south, or north of Pimampiro. (I got turned around in the mountains.) The turn off for Pimampiro is just south of Juncal in the Chota Valley. 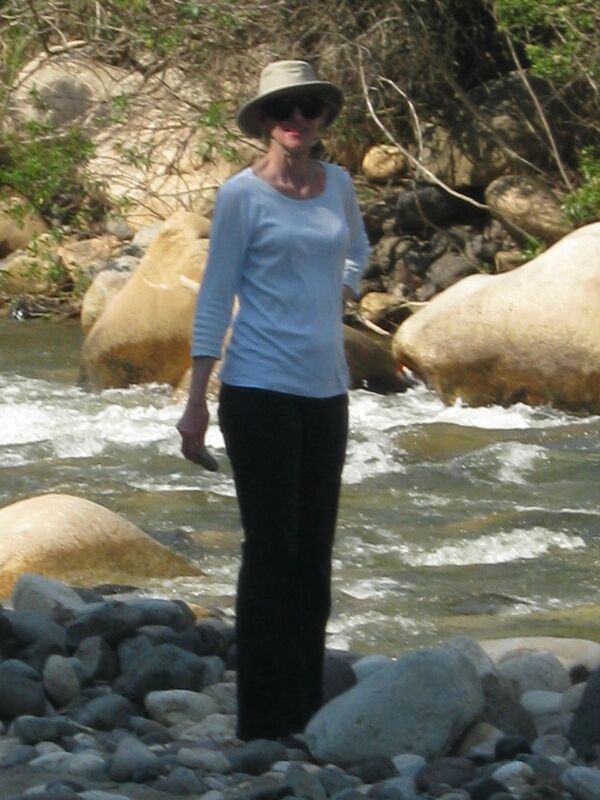 Marilyn thought the area near the bridge across Rio Blanca would be a beautiful spot for a picnic. She was right. Isabel, Victoria, and Brayan came with us. 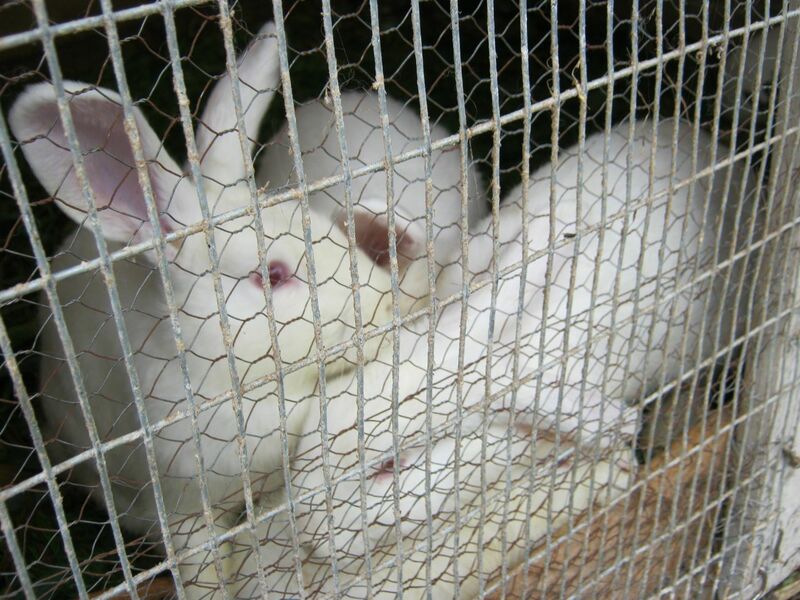 So did Blanca (from Gonzalez Suarez), Marcello, Wilson, Marcella, and Elvis (Blanca's husband and children). Cesar, Luz, and Augusita were also going to come, but they all felt bad today. 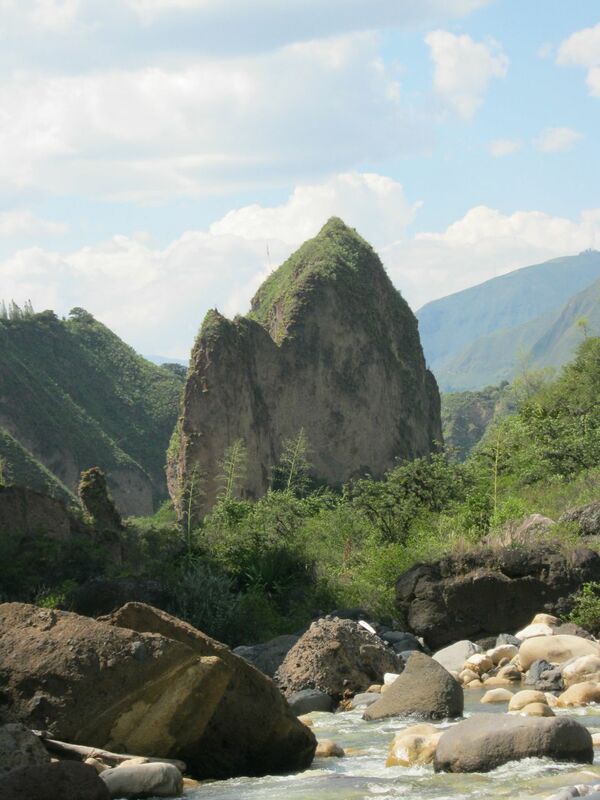 On the drive from Pimampiro to the river, Marilyn stopped a couple of times to point out things she had learned on her field trip, like Incan terraces, the remains of Incan aquaducts, and a sacred rock. It was another spectacular drive in Ecuador, and Marilyn made it interesting as well. I once shook my head when Marilyn decided to take the Quechua class because she has such a hard time learning new languages. If I had the problems she has, I know I wouldn't want to work that hard. But doing so has benefitted us both. She became good friends with Blanca, a member of last year's class, and has learned some neat things about the culture, including new places for us to explore. At the river, it was very sunny and hot. However, there was a large tree right next to the bridge abutment which provided excellent shade. And the ground underneath it was flat. There, we ate our picnic lunch of red beans and rice, fried chicken, and cole slaw. 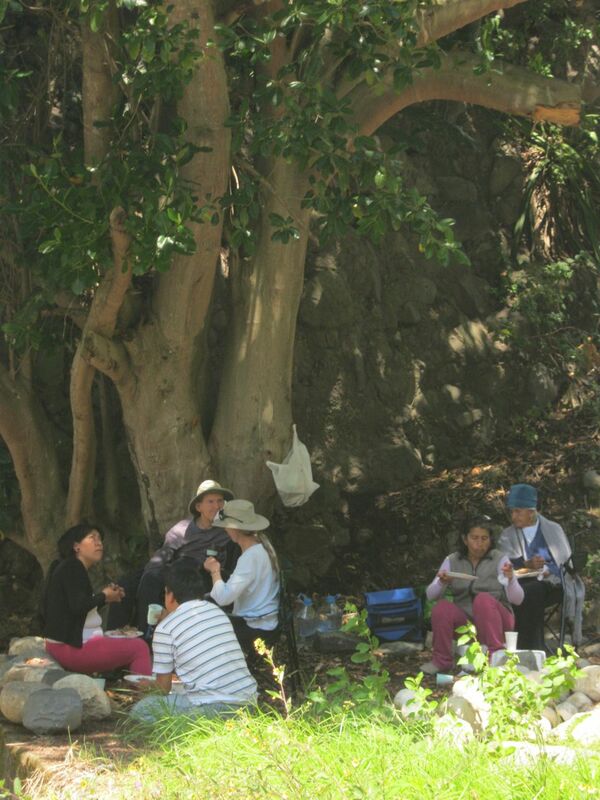 I stayed beneath the shade tree while the rest explored the river and played on its rocks and boulders. 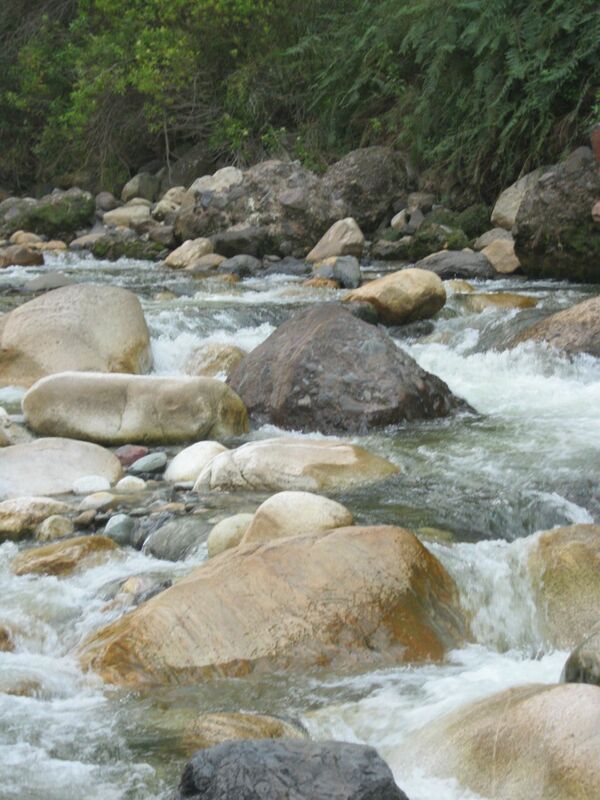 My vantage point offered me a great view of the river's sparkling waters rushing over huge boulders. 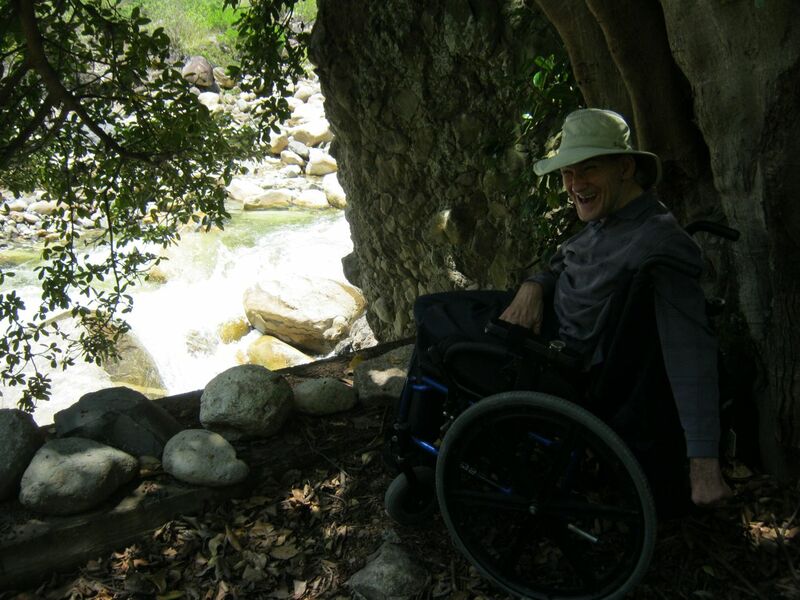 There's nothing like sitting right next to a mountain stream in its wild effort to reach the sea. 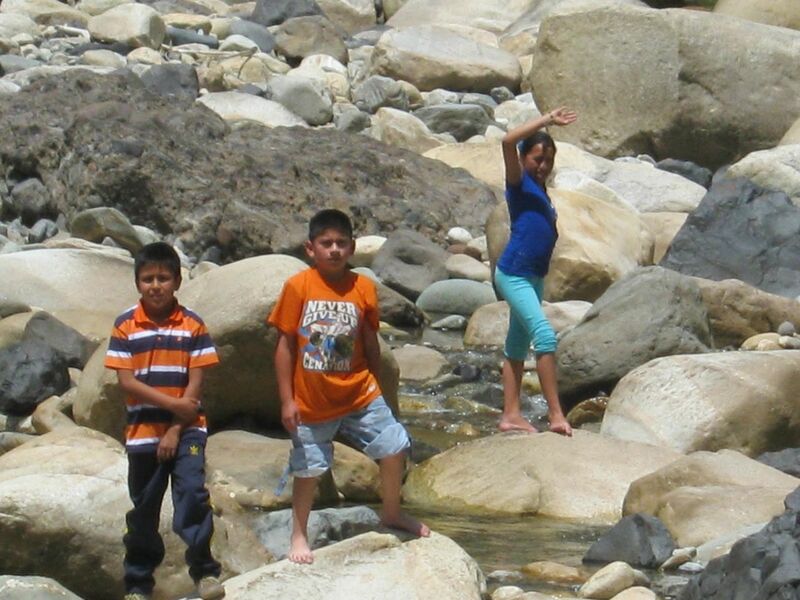 I also had a good view of the rest of our group as they hopped rocks and played at the stream's edge. Besides the river, there were high mountains almost totally surrounding us. It kind of reminded me of being in the Basin of Big Bend National Park in Texas. However, there were thousands of bromeliads on the mountainsides. You don't get that in Big Bend. 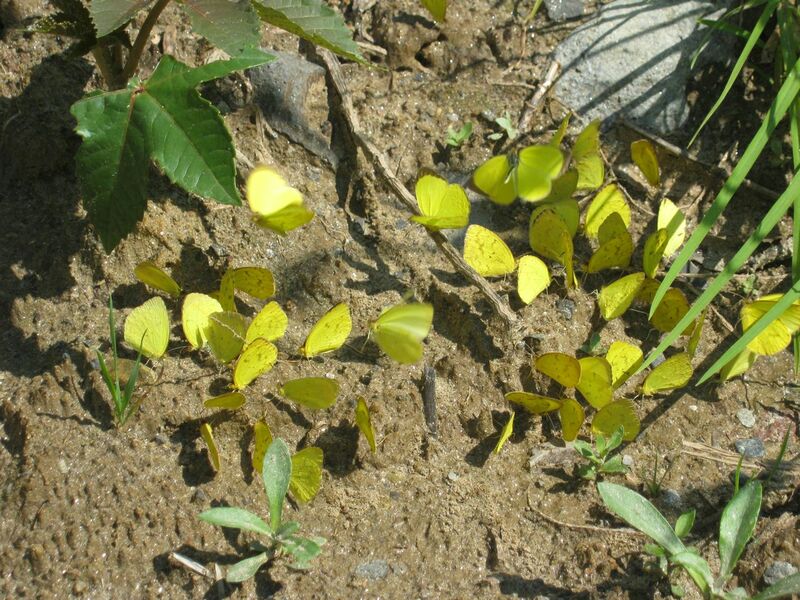 I counted six different types of butterflies while waiting on the rest of our group to return. One was a Monarch butterfly that seemed to be keeping me company. It kept flying near me for almost the entire hour or so that I was alone. 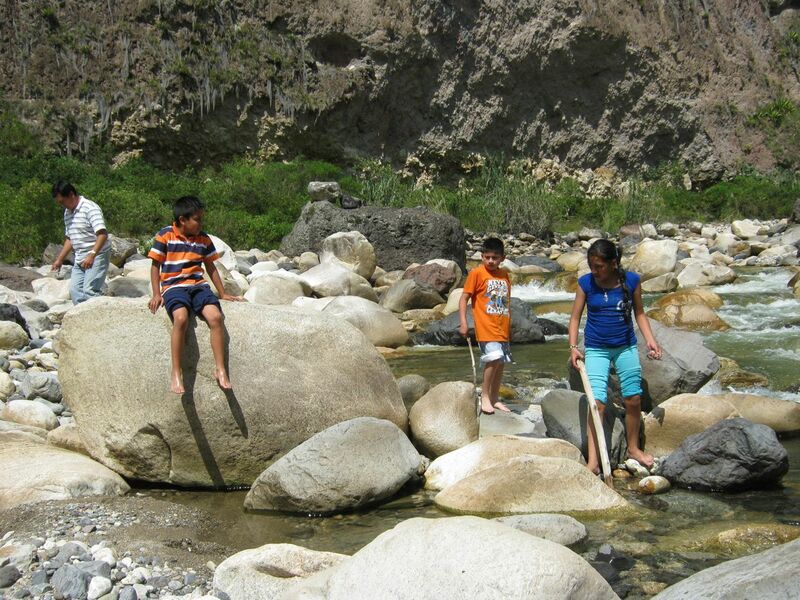 On the way back to Pimampiro, we stopped at another river. However, it wasn't as conducive to playing, so we only stayed for a few minutes. However, it was also very pretty. 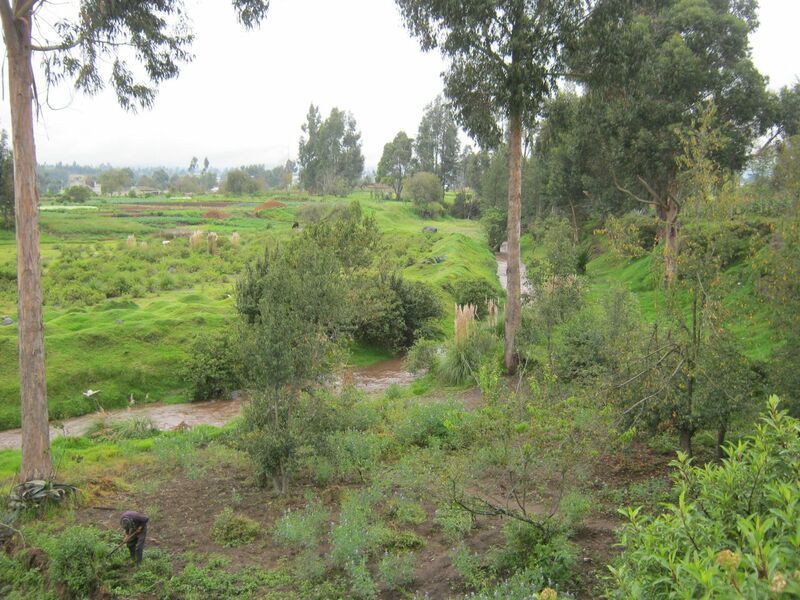 At that spot, one could also see lush crops and orchards on the steep mountainsides across the river. Blanca has a sister in Pimampiro, so we stopped to see her and her daughter. Blanca grew up in Pimampiro and is familiar with the area. She had been to the other river, but not to Rio Blanco and she seemed to revel in the opportunity. Another fine outing in Ecuador. I recently told a friend in an email that the life I lived in the U.S. now seems drab compared to the life I now live in Ecuador. It is so varied. Last week I supported Marilyn as she taught in a pre-school for five days. It was three hours away, so we lived with one of the teachers. Today I was in a gorgeous mountain setting. This Wednesday we'll do something special to show our appreciation for Isabel on Dia de los Trabadores (Ecuador's Labor Day). Can't wait to see what else comes up. Isabel went to a meeting of some of her friends from high school this morning. This is the second time they've gotten together since they had their 30th elementary school reunion about a month ago. They went to the house of one of the members whose father had passed away this week to console her and help however possible. We think it's great that Isabel has found another social outlet. Heretofore, at least for the three years we've known her, she has almost exclusively socialized with family, aside from a male acquaintance and talking on the telephone to her really good elementary school buddy, Auri. We think family is great, but there are many other interesting people in the world.